On Monday, July 3rd we accompanied one of our beneficiaries, Sameer, as he used his food voucher to go shopping for himself and his family. Sameer is 28 years old and lives with his wife Noor and his two young sons ages three and one and a half here in Hashemi Shemali. He, Noor, and his older son fled their home in the far south of Iraq near the city of Basra two years ago after growing sectarian violence. 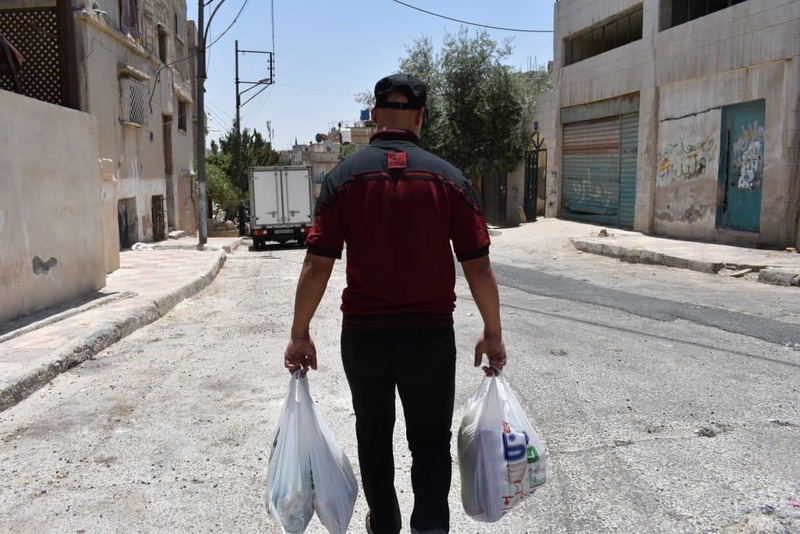 Because refugees in Jordan are not allowed to work, Sameer faces food insecurity and has to mainly rely on CRP’s monthly food vouchers. Each food voucher buys about as much as they might have eaten in one week back home when times were good, and which his family will now have to stretch out over several weeks. 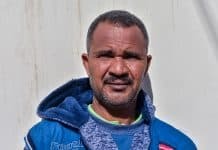 Sameer also tries to work as a caterer for funerals, engagement parties, and weddings once or twice a month, but the work isn’t reliable and doesn’t pay that much. “If there is work offered, then I take it,” says Sameer. It is also risky to do this small amount of work, because it is still illegal. On top of all of this, Sameer is also going through treatment for cancer. At the grocery store, Sameer compares prices on everything he buys, looking for the best deal. 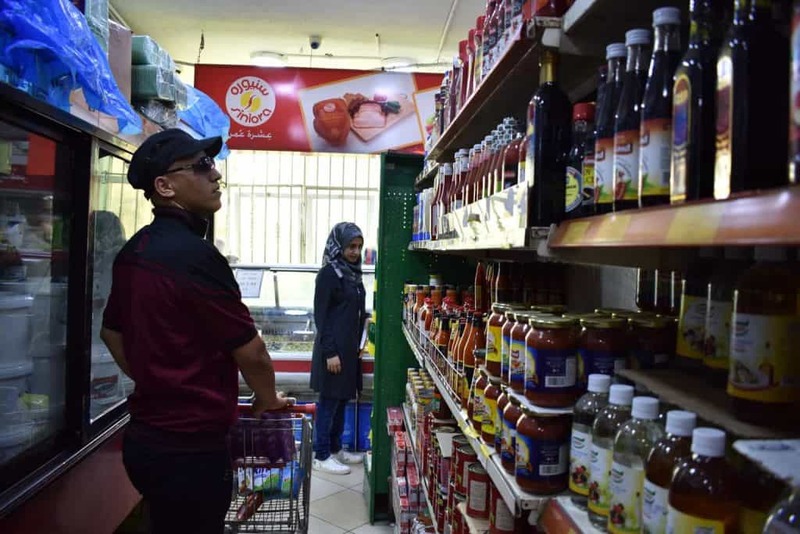 CRP works with select grocery stores in Hashemi Shamali who accept our food vouchers. 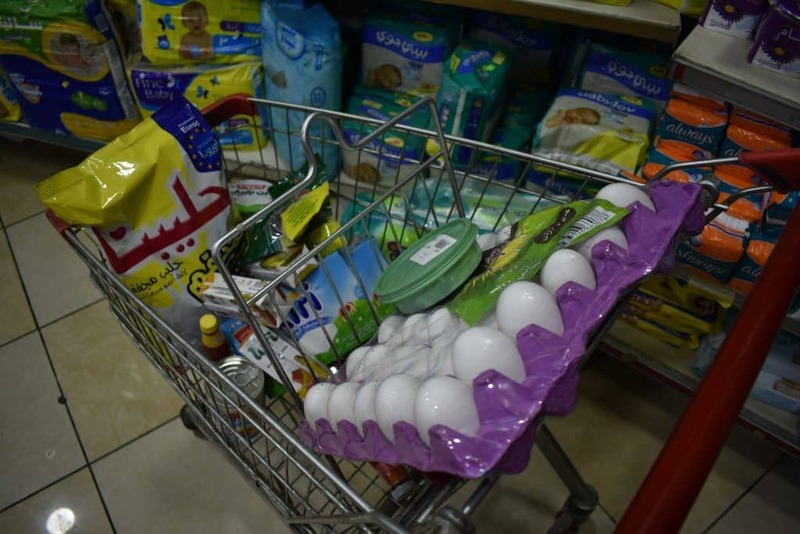 As soon as Sameer grabbed his cart at the store, he immediately went for the powdered milk and explained, “The main concern for every month is the baby’s milk; that is what I look for.” That is also the most expensive item in his shopping cart. “Food that will last . . . that is also what I look for,” Sameer says as he fills his cart up with nonperishable food items he can stretch for the month or at least a few weeks. Along with the powdered milk, he selects eggs, frozen potatoes, and frozen cheese bread that he gets as a special treat for his wife. With the little money he makes from his work he buys more perishable food like vegetables and fruit when they need it. Sameer added a few more items to his cart before checking out, but this is most of what he buys with his voucher. The large bag of powdered milk is the most expensive item in his cart. Many beneficiaries of CRP’s voucher program are going through similar difficulties as they try to get by on little resources. Despite dealing with little food, little money, and medical treatment, Sameer keeps a positive attitude and even invited us inside his house. 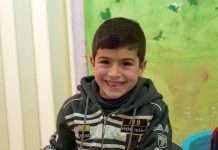 They are glad to be in Amman and away from the sectarian violence that tore their home apart, but hope to someday find permanent resettlement somewhere in the West. We helped Sameer carry his groceries home after shopping. Thanks to all of your donations, we gave out vouchers to 146 families like Sameer’s on July 3rd. Having a reliable source of food once a month helps alleviate the stress of food insecurity these families face. Previous articleMeet Karam, CRP’s New Education Specialist!